Prince William County comprises the 336 square miles south of Loudoun and Fairfax counties. In combination with the independent cities of Manassas (9.88 square miles) and Manassas Park (2.53 square miles), the three jurisdictions make up the Prince William Health District. Prince William County has the largest population in the district, with a total estimated population of 451,721, a 12.4% increase from April 2010. Manassas City follows, with a population of 41,764. Manassas Park City has the smallest population of the health district, with 15,726 residents. According to the US Census Bureau, more Prince William Health District residents identify as white than as any other race or ethnicity, followed closely by Hispanic, and black. Prince William has a white population that is 2/3 the rate of Virginia, and a Hispanic population that is more than twice as large. Prince William has a higher median income than the state of Virginia with a median household income of $99,206 in the County; $72,562 in Manassas City; and $75,429 in Manassas Park City; compared to $66,263 statewide. The district’s average poverty rate is less than the 11.2% statewide rate; however, rates vary within the district. 6.7% of residents in Prince William County live in poverty, while 9.6% of residents in Manassas City live in poverty. Overall, 42.2% of children qualified for a free or reduced-price school lunch, the same rate as children across Virginia. Based on health outcomes, the Prince William Health District has health indicators comparable to the rest of Virginia. The average life expectancy for a male in Prince William County is 78.7 years of age, which is higher than the statewide average of 76.6 years of age; while life expectancy is 76.5 years in Manassas City and Manassas Park City. The average life expectancy for a female in Prince William County is 82.3 years of age, higher than the Virginia average of 81.3 years; while female life expectancy in Manassas City and Manassas Park City averages 80.8 years. The infant mortality rate in Prince William was 4.5 per 1000 live births, less than Virginia’s rate of 5.7 per 1000 live births. Cancer is the leading cause of death in the health district. 8% of adults in Prince William County have diabetes, compared to 9% statewide. The HIV prevalence rates of Prince William County (226.2), Manassas City (280.4), and Manassas Park City (171.3) are lower than the statewide rate of 298.5 cases per 100,000 people. Drug overdose is the leading cause of injury death among people 25-54 years old, causing more deaths than motor vehicle traffic crashes. Virginia saw a statistically significant (14.7%) increase in drug overdose deaths from 2013 to 2014. Opioid overdoses, whether prescription painkillers or heroin, primarily drive the statewide rate of 11.7 deaths per 100,000 citizens. Manassas City, where the mortality rate from drug overdoses has increased from 8 to 14 deaths per 100,000 citizens over the last decade, is disproportionately affected by this. Although health indicators assist in understanding the health of a geographically defined population, they do not tell the whole story. For example, a baby born in census tract 9009.01 in Dumfries can be expected to live 7 fewer years than a baby born on the other side of Interstate 95, in nearby Montclair (census tract 9010.07). In crossing the interstate, median income drops from $105,528 in Montclair to $47,238 in Dumfries; the percentage of adults with at least a bachelor’s degree drops from 47.8% to 15.5%; and the percentage of black and Hispanic residents more than doubles from 18.3% and 10% in Montclair, to 43.6% and 22.3% in Dumfries, respectively. Other measures of health outcomes tell similar stories of inequity when broken down by race: black residents have an infant mortality rate 3 times greater than that of white residents. Amongst Medicare beneficiaries 65+, black residents have an increased rate of hospitalization due to high blood pressure, compared to their white or Hispanic neighbors. Hispanics in Prince William County fare better than those in the rest of the state with a lower rate of hospitalization due to high blood pressure and a much lower rate of hospitalization due to heart disease. Within Prince William Health District, there are significant disparities in health amongst people of different races, ethnicities, and incomes. These differences can be partially attributed to social determinants of health, which, according to the World Health Organization, are the conditions in which people are born, grow, work, live, and age. Although Prince William County has a number of health resources, accessing health services proves challenging for some county residents. There is one primary care physician for every 2,350 residents of Prince William County. These resources are not evenly spread, however. According to HRSA, Manassas City, Manassas Park City, and southeast Prince William County between Dumfries, Montclair, Dale City, and Woodbridge, are all designated medically underserved areas, meaning they contain fewer than one primary care physician for every 3,500 residents. Three hospitals serve the region: two within the Novant Health UVA system, and Sentara Northern Virginia Medical Center. In addition to location, cost may be a barrier for the 15.7% residents under the age of 65 who are uninsured. Prince William County has the lowest uninsured rate in the health district, at 15%; however, this rate is higher than Virginia’s rate of 14%, and higher than the uninsured rates in surrounding Loudoun and Fairfax counties (9% and 12%, respectively). Manassas City and Manassas Park City contain the second and seventh highest uninsured rates in the state, at 20% and 23%, respectively. Those without insurance or resources to pay for care rely on safety net clinics for primary health care services. There is one Federally Qualified Health Center (FQHC), the Greater Prince William Community Health Center, with multiple locations serving Prince William County and the surrounding area. There is also one free clinic, the Prince William Area Free Clinic, that serves uninsured residents of Prince William, Manassas, and Manassas Park. 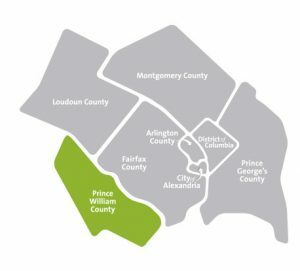 Several local clinics provide services to underserved communities: The George Mason School of Nursing’s Mason and Partners (MAP) Interprofessional Clinic, the Pediatric Primary Care Project, Sentara’s Potomac Hospital Family Health Connection mobile clinic, and Inova Juniper’s HIV/AIDs clinics. The Prince William Health District provides pregnancy testing, prenatal care, and women’s health services, immunizations and tuberculosis testing, and services for detecting and treating sexually transmitted infections to some residents. Although Prince William Health District is generally healthy, inequities amongst its residents exist. Making the district a healthier place for all to live requires not only improving upon wellness initiatives and access to quality healthcare, but addressing needs pertaining to the economic and social well-being of its citizens.